Organizing and throwing a dinner party is hard work. But imagine trying to organize a dinner party for over a hundred ravenous guests. Then imagine trying to cater for 800 people, night after night, for an entire month. This is bread and butter for the hardworking staff of one of Istanbul's most historic restaurants-'Ali Baba'-as it prepares for Ramadan, which starts on Monday. Chefs, waiters and owners of Ali Baba, which opened in 1939 in the city's touristic Süleymaniye neighborhood, have shared their secrets with Anadolu Agency as they get ready for one of the most pressurized months of the year. This swarming restaurant is located in front of the largest mosque in Istanbul; one of the best-known sights of the city, and close to Grand Bazaar, one of the oldest covered markets in the world with over 4,000 shops. Ramadan, the ninth month of the Islamic calendar, is a time when Muslims will fast from dawn to dusk, with the practice forming one of the five fundamentals-pillars-of Islam. During Ramadan, Muslim people cram into restaurants an hour before the evening 'adhan'-the Islamic call to worship, which permits the faithful to break their fast-which in summer can last 17 hours. Recep Divli, the restaurant's 54-year-old senior chief has confidence in his colleagues, saying: "[The] waiters know their onions." "If you are an experienced waiter, you serially serve dishes… if not, you will make a hash of it," Divli tells Anadolu Agency as he directs colleagues to serve arriving customers. 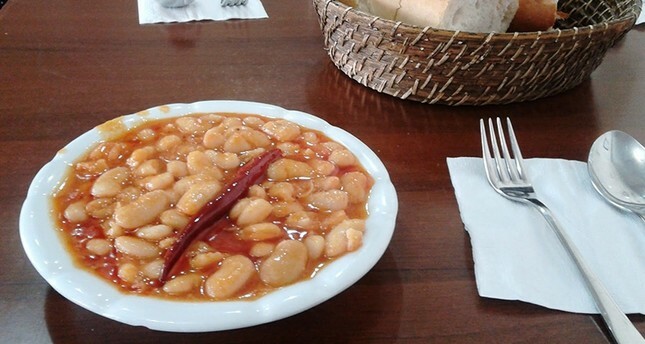 The senior chief, who has 26 years experience in the sector, has worked at Ali Baba-famed for its 'kuru fasulye' [traditional baked beans]-for 12 years. He proudly says that the restaurant hosts about 800 guests every night, all at once, during Ramadan. "We simultaneously distribute all meals within half an hour," Divli says as one waiter, carrying four full plates of food in just one hand rushes past. Glancing at his hurrying colleague, the laughs and says: "I witnessed him carrying seven plates in one hand." The gifted waiter turns out to be 38-year-old Emin Oruc. The skillful waiter has been in his role for four years and shares his secret, saying: "Before that I had washed dishes for four years in the scullery. "I accustomed myself there [by scrubbing plates]." Naturally, even if a restaurant has the best waiters in the world, you should increase the number of employees during Ramadan as extra-hungry custumers expect fast service. The chief stated that the business currently has 15 waiters in addition to seven or eight busboys. Less-experienced waiters will be employed for the holy month. "The temporary busboys are just carrying plates and picking up the empties on the table, not waiting on customers," Divli says. However, the waiter, Oruc, says it is difficult for the staff because they too are fasting, just like the customers. Oruc says that they have a quick fast-breaking meal after they collect empty plates and make out bills for customers "nearly an hour later". "But, you do not feel your hunger or thirst due to the excitement while you serve. Even if it was 10 hours, it does not matter," Oruc says. He just expects understanding from customers that they should place their entire order at one time, instead of piece by piece. The chief and the waiter say they feel stress a few days before the tiring month but put it down to high spirits. The restaurant is decorated with wooden materials, such as brown tables and chairs on the quad, and a photo of its scowling, bearded founder is hung inside the restaurant. When asked who the current owner of the business was, Chef Divli points to a portly man sitting on a chair out front. The man, Adnan, laughs when approached: "I am in reverse gear, support service now. Have a talk with my brother!" Ali Baba, it seems, is run by two brothers. Adnan's brother, Ayhan Akyildirim, 58, is co-owner of the historic eatery-the pair split their duties between them. "My brother [Adnan] is very good at cooking, so I arrange the finances," Ayhan says. Ayhan states that, in an ordinary day, customers sit, order, pay and go in a cycle which "is easy to control". "But, in Ramadan, before the adhan, they sit at the tables and want their soup simultaneously," he says. Ayhan states that they prepare their tables-before hungry customers come-with bread, water and other side dishes to ease the food service. "And, we distribute the soup just five minutes before the adhan," he says, adding that the people relax when they have soup, making the staff's job. "In that way, we can gain time," he says. During the conversation, Ayhan's eyes were following some calculations written on a piece of paper. "The paper reflects the cost of the Ramadan month. Some think that we earn more money," Ayhan says ruefully. However, the owner points out that he needs to employ more staff and buy extra tables but after the holy month, the extra staff departs and the tables are put in storage-which costs money. "Everyone thinks income but no one thinks expense," he adds, good-humoredly.